Following the most successful regular season in the history of the franchise, the Clippers won a playoff series for just the second time ever by beating the Grizzlies in Game 7 on Sunday. This series was already the most exciting first-round series in this year’s playoffs even before it went to Game 7, so I’m guessing that many of you had plans to catch the game. But with Sunday being Mother’s Day, there’s a good chance that you ended up missing it because finding a store that had flowers and cards for your mom at the last minute wasn’t as easy as you thought it would be. Well, don’t worry if that was you, because I watched the game for you and made sure to document all of the important things you missed. The Clippers have always been more of a punchline (like the Pittsburgh Pirates) than they’ve been lovable losers (like the Chicago Cubs), but I still remember a time when neutral fans cheered for them in the playoffs because they were obvious underdogs, and cheering for underdogs is as longstanding an American tradition as obesity and not using the metric system. But ever since the addition of Chris Paul and Blake Griffin’s declaration that Paul would turn Los Angeles into “Lob City,” it seems like the Clippers have become the second-most hatable team in the NBA behind only the Heat. Not that the Grizzlies were completely innocent, but throughout the entire series, the Clippers flopped, whined about calls, and sparked altercations after the whistle had been blown. 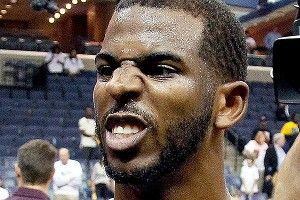 Chris Paul spent more time talking trash to Zach Randolph than he spent talking to his own teammates, Blake Griffin stared down opponents after he dunked, and Nick Young celebrated every basket he made as if he’d just won a lifetime supply of Doritos Locos tacos from Taco Bell. To the casual observer, it’s hard not to look at the Clippers as an obnoxious and entitled group of immature guys who act like they’ve accomplished something even though they haven’t. But be that as it may, if I were a Clippers fan, I’d be thrilled with how this team is acting, because it’s clear that they are a confident bunch — and “confident” is a word that has rarely been used to describe the Clippers. I know that for some people Sunday’s game will be classified as a classic slugfest, one in which the refs swallowed their whistles and let the players play. But to me it was nothing more than a wrestling match with a ball. Every possession, it seemed like there were five fouls that could have been called but weren’t. I get that playoff basketball is supposed to be more physical and the players are supposed to “earn it.” But if I want to watch low-scoring physical basketball, I turn on a Big Ten game. When I watch the NBA, I want to see fast-paced, high-scoring games in which the players’ skills shine. That wasn’t even close to what I got on Sunday. Because of what was at stake, I admit that I was still captivated throughout the game. But moving forward I’m crossing my fingers that the rest of the playoffs will have more games featuring dunks, 3s, and nice passes than ones featuring guys pushing each other around, falling over, and staring at the refs with disgruntled faces. I’m guessing it won’t make the loss any easier for Grizzlies fans to stomach, and I admit that I’m not exactly sure what “grinding” means when used as a slang term, but that’s not going to stop me from saying that the Grindhouse brought their A-game on Sunday and was really grinding all day long. It was the first home Game 7 in the franchise’s history, and that certainly played a huge part in making the Memphis crowd the best of the playoffs so far, but even taking that into account I was impressed with how engaged and loud the fans were from start to finish. I mean, look no further than the dude sitting on the front row by the Grizzlies’ bench who was wearing a highlighter-yellow shirt (? ), jean shorts (?? ), and goggles (?!?!?! ), and was on his feet waving a towel for most of the game. When Jack Nicholson and Spike Lee sit courtside at Lakers and Knicks games and occasionally stand up to cheer, they always seem to get credit for being their teams’ biggest fans, even though the truth is that there are thousands of people in the upper deck at those games who are bigger fans than those guys but just can’t afford courtside seats to every game. But unlike Nicholson and Lee, the guy sitting courtside at Sunday’s game was literally and figuratively the biggest Grizzlies fan in the building and was quite clearly on his grind throughout the game. It goes without saying, but when the courtside fans are as into the game as much as he was (or as much as this kid from an earlier game in the series), you know you’ve got a crowd to be proud of. 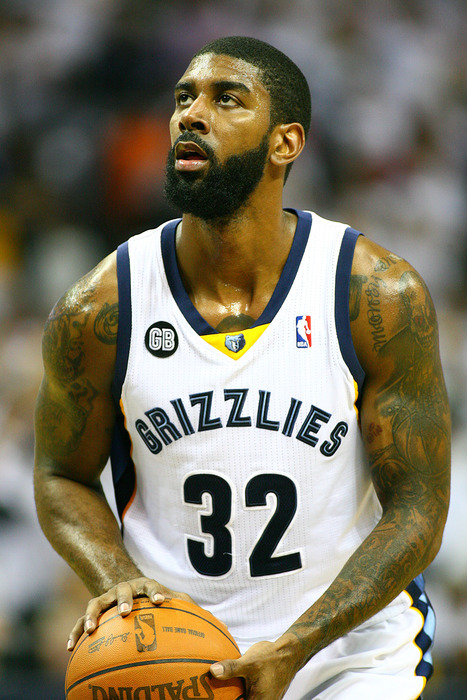 For some reason, far too many NBA fans overlook Mayo when discussing the game’s greatest beards, and instead mention people like James Harden, Baron Davis, and DeShawn Stevenson. All it takes to prove this is to Google Image search “best NBA beards” and discover that Mayo doesn’t show up until the fifth page even though Steve Nash, Tim Tebow, Martin Van Buren, and a (hopefully) Photoshopped picture of Emma Stone show up in the first four pages. 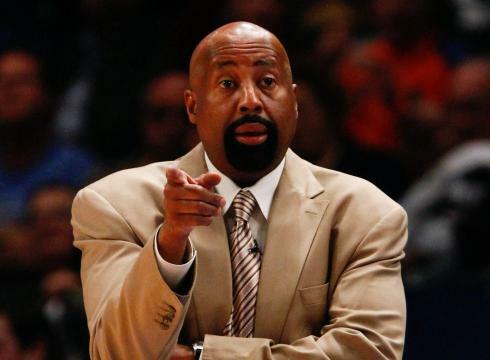 Well, I can’t sit back any longer and let Mayo and his beard continue to get disrespected, especially since he’s the best the NBA has to offer, and the only guy in the league who poses a threat to his beard title is Knicks coach Mike Woodson, who, judging by how immaculate his goatee is, would no doubt have the title if he decided to grow his entire beard out. The fact of the matter is that Mayo’s beard is the perfect combination of color (pitch black), consistency (it has no weak spots), style (just a well-groomed standard beard instead of that point thing Stevenson usually has or something outrageous like Scot Pollard used to have), and volume (there’s enough there to consider it a man’s beard but it’s not obnoxiously protruding like Harden’s). Simply put, it’s the kind of beard that can make the ladies weak in the knees and gain the respect of the fellas, which is a rarity in this day and age.